THE CHURCH OF ST. JOHN THE BAPTIST KIHIKIHI. In the late 1830’s the KihiKihi area was served by Father Pezant S.M. from the flourishing “Mission of the Holy Angels” at Rangiaohia the chief village of the Waikato District and it is on record that Bishop Pompellier confirmed 146 people there in 1844 and that Bishop Ward (afterwards first Bishop of Wellington) visited the district in 1848 and confirmed 580 people. In 1850 Fr. Garaval was appointed and served until 1858 when he was followed by Fr. O’Hara until 1862. The area is described as beautifully situated, with a peaceful industrious population busily engaged in the cultivation of Wheat, Maize, potatoes; caring for numerous horses and herds of cattle, and greatly helped by a water driven flour mill (probably the one which was situated on St. Leger Road – some of the earthwork of the dam are still intact and the grinding stones from it are in the Te Awamutu Museum). Unhappily the Battle of Rangiaohia in February 1864 and the Battle of Orakau in April 1864 changed all the pattern of life in the district. Fr. Viney was appointed in 1864 and served the wide Waikato area until 1871 and Fr. Golden came in 1874. 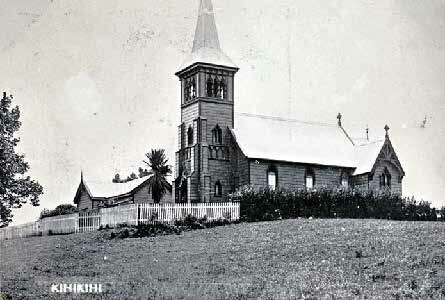 KihiKihi was now coming into prominence as a centre of population and the need for a church was pressing so a temporary church innocent of paint or lining was built on land donated by Mr. William Corboy at the corner of Rolleston and Short Streets which forms part of the present Church property. In addition to this acre and a half a further acre was purchased from Mr. and Mrs. Kenny at a cost of £264.16.2. That year also saw the appointment of Fr. A. Luck, 0.S.B., who served the district for eighteen years. At first he resided in Hamilton but in 1884 assisted by a few local men he built the first Presbytery in KihiKihi. One of those men was a Mr. Jones (many years afterwards a Mayor of Dargaville) who learned the building trade from Fr. Luck. Next he built a stable, then a workshop, and from this there flowed much evidence of his skilled hands the old carved altar which graced St. Benedict’s Church in Auckland for many years was an example. Also in the KihiKihi church there are many examples particularly of work he did with a foot lathe in the ornamentation of the building. Unfortunately much of this work was with soft wood and it became borer infested. The church built in 1880 was complete with a tower but apparently this part of the structure was poorly built as it was very rickety in 1884 and was pulled down by Fr. Luck personally. (legend has it that no-one else was game to do the job) and he built the present very ornate tower and spire in its place and he also built a sanctuary. Fr. Luck was very interested in gothic architecture and he modelled the alterations to make the church similar in plan to the Parish Church at Ramsgate in England (his old parish church) and it is interesting to relate that a few years ago some relatives of the late Fr. Luck called when passing to see the Church but unfortunately no-one was at home in the Presbytery at the time so they left a note to the effect that the likeness was remarkable. Unfortunately the ravages of time and the borer have made inroads into this very lovely old church and as it is now too small for present needs it must give place to a new building and be demolished unless the National Historic Places Trust can find some means of preserving what is probably one of the finest examples of Gothic architecture in New Zealand – certainly in the Auckland province. During his term at KihiKihi Fr. Luck attended to the spiritual need of the people from Rangiriri to Taumarunui and apparently he was also capable of looking after their material needs also for it is related that on one occasion be was riding along a road and came upon a steam driven traction engine which had broken down. He dismounted from his horse and proceeded to effect repairs – a truly remarkable man. He died in 1899 and was succeeded by Fr. Croke and he in turn by Fr. Lynch who in 1913 transferred his headquarters to Te Awamutu. In 1916 the Mill Hill Fathers made Kihi Kihi their headquarters for the Maori Mission until 1935, and the area was served in succession by Fathers Jansen, Zanna, Schoonhof and Hoogveld. When the Mill Hill Fathers withdrew Kihi Kihi was served from Te Awamutu first by Fr. O’Flynn and then by Fr. Colgan until 1959 when Fr. Gormly was appointed parish priest of Kihi Kihi. When Fr. Lynch transferred to Te Awamutu the Presbytery built by Fr. Luck was sold and shifted to a new site in the Kihi Kihi township and some years later was destroyed by fire. When Fr. Gormly arrived a new presbytery was built and a small building which had served during the time of the Mill Hill Fathers was converted into a Parish Hall. Fr. Daly succeeded Fr. Gormly in 1960 and was himself succeeded by Fr. Shannahan in 1967 and the present parish priest Fr. Fagan was appointed in 1970. Associated with the church from earliest days were the Corboy family, a Miss Donovan (whose legacy of £500 in the 1920’s was the nucleus of the fund for the proposed new church) the Verner family, the Moody family (Mrs. Moody played the organ) the Roger Kay family, the Fitzpatrick family, the Hayes family (the late Mr. Hayes took up the collection for many years and could remember the tower being built) the Linehan family (father and two sons successive parish secretaries) the Brill family, the 0’Brien family whose daughter Mrs. Kerr was very prominent in organising the catering side of so many social functions to mention some who come to mind. In many cases two and even three and four generations of the same family have served on various committees and have worshipped in this church so it will be a sad day for many people when the building is demolished. Journal of the Te Awamutu Historical Society, Vol. 5, No. 2, 1970.